Carrots are not always orange. This popular vegetable can appear in white, yellow, red, and purple. The orange color is popular and well-known, said to be the result of 17th-century Dutch farmers who selectively bred the orange variants in a higher quantity, to symbolize the Netherlands through its nation’s chosen color and independence. Before them, carrots have been known for its many colors and grown as a food source around the world. The color is dependent on the wavelength of light they absorb, creating the natural pigments. They still do, but the orange ones remain the most popular for being an excellent source of beta-carotene in its natural pigment. Also, popularized in modern times by the famous cartoon rabbit, Bugs Bunny. His original voice actor, Mel Blanc, did not like carrots and spit them out while eating them in voicing sessions. I like them because they are filling, and a healthy way to rid hunger while avoiding fast food. The picture above was taken a stand at Seattle’s Pike Place Market, where you can buy some of these unusual carrots. A wonderful Pop-Up dinner on a rainy night. Sometimes, a night needs to be different and special for no particular reason. Find an opportunity, to enjoy a couple hours with good food among strangers and friends. If it centers around dinner, all the better. Such was last Sunday evening at Peleton Cafe in Seattle’s Central District, while the rain poured down outside. I arrived by invitation to a special dinner event hosted by my good friend Megan Davies, certified holistic chef and health educator. There, happened one of her Tigress Nutritional Support Pop-Up Dinners, hosted monthly. With each event, Megan provides and cooks to those present in four courses of tasty, nourishing, healthy food dishes (and gluten-free with vegan alternative options). So, here is what I had (as shown in pictures below): Teaser: Sweet potato, coconut bacon and avocado canapes with burdock kimchee. Starter: oyster and maitake mushroom bisque. Main: French lentil, pork shoulder and fennel pesto (alternative not shown, chanterelle, pear and pumpkinseed Fettuccine with garden herbs and spinach). Dessert: pumpkin mousse with coconut whip and pecans. Libations were added, containing a helping of malus cranberry ginger beer (not shown). Overall, a fantastic night. Besides the food, guests are encouraged to greet and meet others at the tables, especially strangers. That I also did and made new friends at that good time. For more info on the Tigress Nutritional Support Pop-Up Dinners held in Seattle, visit http://www.tigressnutritionalsupport.com, and click on the Pop-Up tab (next one is December 10th). Seats are by ticket, and extremely limited. Send me a note if you attend. I may see you there! I took a little time out to enjoy a local treat, being a Seattle-style hot dog. This is your usual hot dog but grilled meat (or veggie substitute) with cooked sweet onions and cream cheese on a toasted bun. For better, add some other veggie bits, and use a higher grade of cream cheese than the cheap brand name spreads and warm that up. For messy action, throw whatever condiments you love on top of it; sauerkraut, mustard, BBQ sauce, whatever. Somehow it all works out, for a fine tasty guilty pleasure. Such was my fine evening moment, taking time out on the way home to enjoy this at Westlake Park (though, I refrained on the extras). The best Seattle Dog there you will find, is the “Dog in the Park,” stand in the back area. They have other Hot Dogs styles as well, but I find this one to be the best taste, for those hungry and passing through the area on a warm summer evening. It’s been a while and here I am back with a hot dog and fries! And not just any hot dog, but a Tokyo Dog from the annual Seattle Street Food Festival. 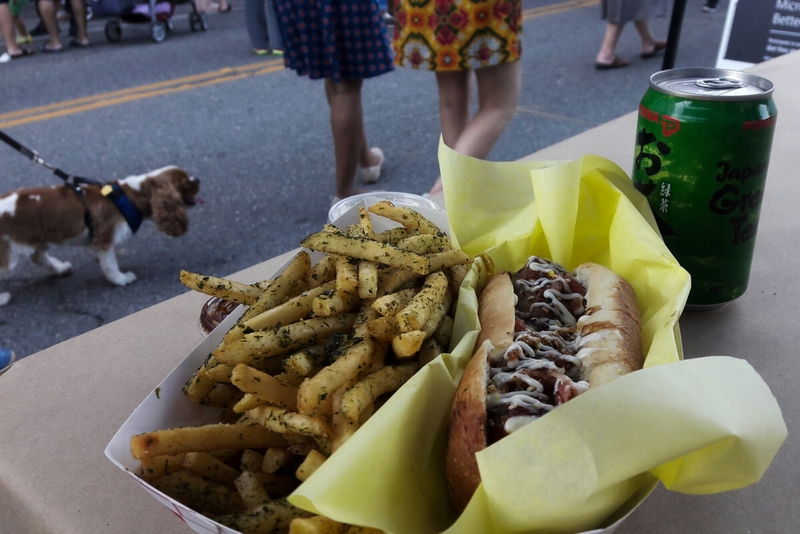 The Tokyo Dog was from one of the many food trucks present over this weekend; presenting interesting food and merchants for those wanting more out of their summer weekend than sunshine. The meal in question contains the following. A smoked cheese bratwurst with butter teriyaki onions, bacon bits, furikake, tonkatsu sauce and Japanese mayo. The fries on the side are seasoned with seaweed and sea salt. The drink is some boring canned green tea. Meanwhile, much has happened since my last posting (and some before). I will post some of that in good time, soon. “Morchella, the true morels, is a genus of edible mushrooms closely related to anatomically simpler cup fungi. These distinctive fungi appear honeycomb-like, with their cap composed of a network of ridges with pits. Morels are sought by thousands of enthusiasts every spring for their supreme taste and the joy of the hunt, and are highly prized by gourmet cooks, particularly in French cuisine. 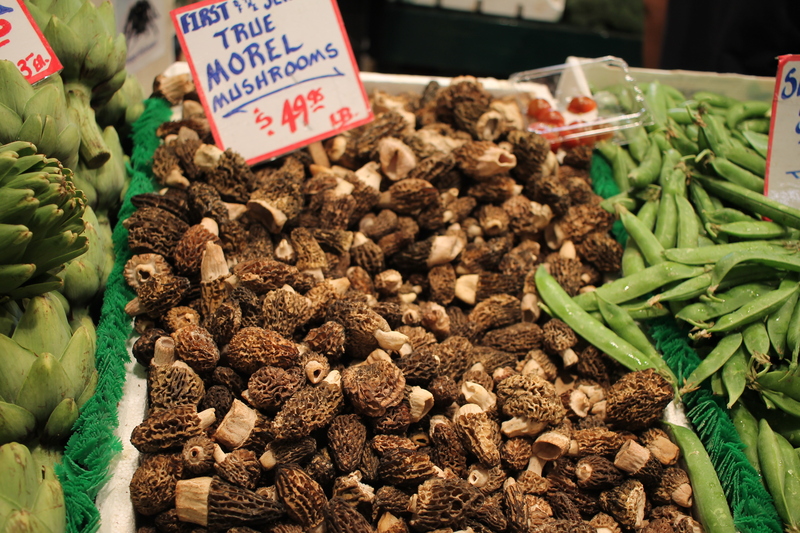 Morels have been called by many local names; some of the more colorful include dryland fish, because when sliced lengthwise then breaded and fried, their outline resembles the shape of a fish; hickory chickens, as they are known in many parts of Kentucky; and merkels or miracles, based on a story of how a mountain family was saved from starvation by eating morels. In parts of West Virginia, they are known as molly moochers or muggins. Due to the partial structural and textural similarity to some species of Poriferans (sponges), a common name for any true morel is sponge mushroom. There is some ominous warnings about the dangers of eating morels at the bottom of the wiki entry..
“Morels contain small amounts of hydrazine toxins that are removed by thorough cooking; morel mushrooms should never be eaten raw. It has been reported that even cooked morels can sometimes cause mild symptoms of upset stomach when consumed with alcohol. And now you know, and knowing is half the battle!